UAVs (or drones) are starting to be used for search & rescue operations, such as in the Philippines following Typhoon Yolanda a few months ago. They are also used to find missing people in the US, which may explain why members of the North Texas Drone User Group (NTDUG) are organizing the (first ever?) Search & Rescue challenge in a few days. The purpose of this challenge is to 1) encourage members to build better drones and 2) simulate a real world positive application of civilian drones. 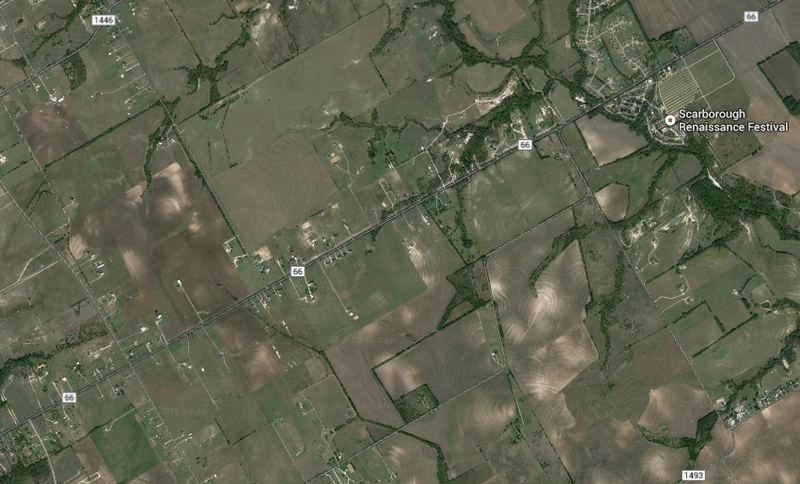 Nine teams have signed up to compete in Saturday’s challenge, which will be held in a wheat field near Renaissance Fair in Waxahachie, Texas (satellite image below). The organizers have already sent these teams a simulated missing person’s report. This will include a mock photo, age, height, hair color, ethnicity, clothing and where/when this simulated lost person was last seen. Each drone must have a return to home function and failsafe as well as live video streaming. 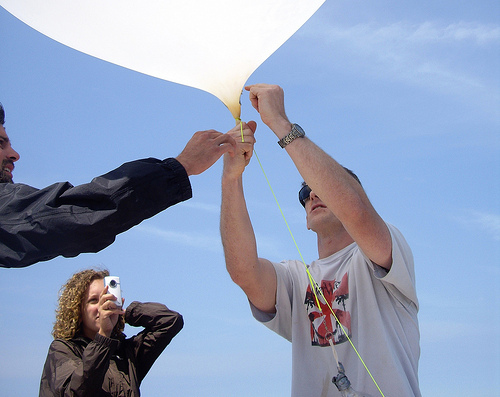 When the challenge launches, each team will need to submit a flight plan to the contest’s organizers before being allowed to search for the missing items (at set times). An item is considered found when said item’s color or shape can be described and if the location of this item can be pointed to on a Google Map. These found objects then count as points. Points are also awarded for finding tracks made by humans or animals, for example. Points will be deducted for major crashes, for flying at an altitude above the 375 feet limit and risk disqualification for flying over people. While I can’t make it to Waxahachie this weekend to observe the challenge first-hand, I’m thrilled that the DC Drones group (which I belong to), is preparing to host its own drones search & rescue challenge this Spring. So I hope to be closely involved with this event in the coming months. Although search & rescue is typically thought of as searching for people, UAVs are also beginning to appear in conversations about anti-poaching operations. 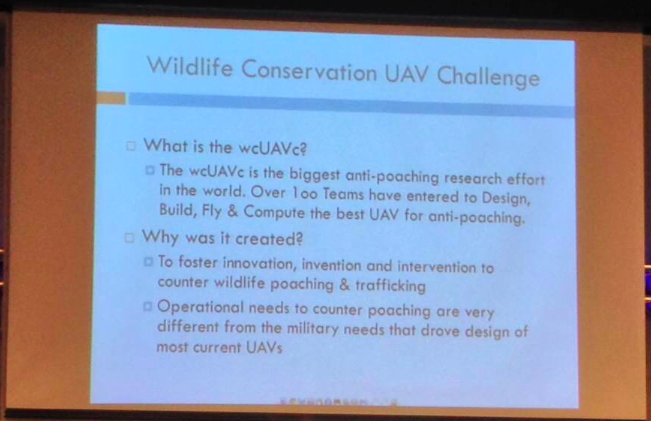 At the most recent DC Drones MeetUp, we heard a presentation on the first ever Wildlife Conservation UAV Challenge (wcUAVc). The team has partnered with Krueger National Park to support their anti-poaching efforts in the face of skyrocketing Rhino poaching. 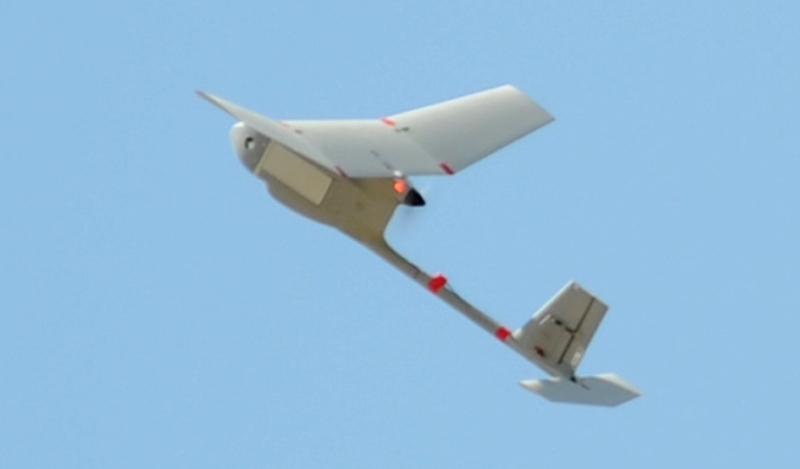 The challenge is to “design low cost UAVs that can be deployed over the rugged terrain of Kruger, equipped with sensors able to detect and locate poachers, and communications able to relay accurate and timely intelligence to Park Rangers.” In addition, the UAVs will have to “collect RFID tag data throughout the sector; detect, classify, and tack all humans; regularly report on the location of all rhinos and humans; and receive commands to divert from general surveillance to support poacher engagement anywhere in the sector. They also need to be able to safely operate in same air space with manned helicopters, assisting special helicopter borne rangers engage poachers.” All this for under $3,000. Why RFID tag data? Because rangers and tourists in Krueger National Park all carry RFID tags so they can be easily located. If a UAV automatically detects a group of humans moving through the bush and does not find an RFID signature for them, the UAV will automatically conclude that they may be poachers. When I spoke with one of the team members following the presentation, he noted that they were also interested in having UAVs automatically detect whether humans are carrying weapons. This is no small challenge, which explains why the total cash prize is $65,000 and an all-inclusive 10-day trip to Krueger National Park for the winning team. I think it would be particularly powerful if the team could open up the raw footage for public analysis via microtasking, i.e., include a citizen science component to this challenge to engage and educate people from around the world about the plight of rhinos in South Africa. Participants would be asked to tag imagery that show rhinos and humans, for example. In so doing, they’d learn more about the problem, thus becoming better educated and possibly more engaged. Perhaps something along the lines of what we do for digital humanitarian response, as described here. In any event, I’m a big proponent of using UAVs for positive social impact, which is precisely why I’m honored to be an advisor for the (first ever?) 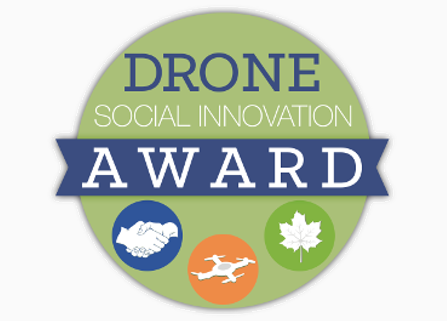 Drones Social Innovation Award. The award was set up by my colleague Timothy Reuter (founder of the the Drone User Group Network, DUGN). Timothy is also launching a startup, AirDroids, to further democratize the use of micro-copters. 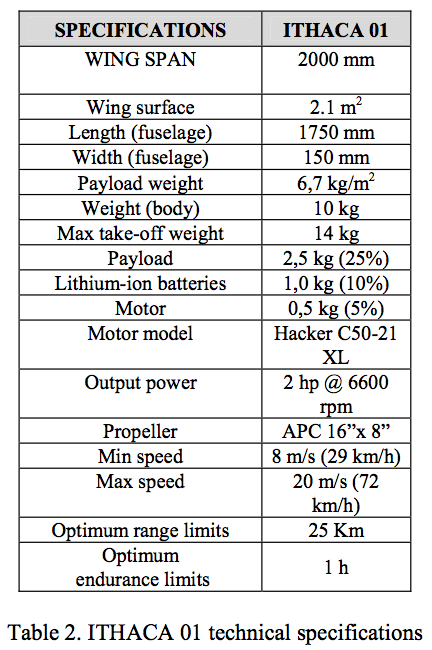 Unlike similar copters out there, these heavy-lift AirDroids are easier to use, cheaper and far more portable. As more UAVs like AirDroids hit the market, we will undoubtedly see more and more aerial photo- and videography uploaded to sites like Flickr and YouTube. Like social media, I expect such user-generated imagery to become increasingly useful in humanitarian response operations. If users can simply slip their smartphones into their pocket UAV, they could provide valuable aerial footage for rapid disaster damage assessments purposes, for example. Why smart-phones? Because people already use their smartphones to snap pictures during disasters. In addition, relatively cheap hardware add-on’s can easily turn smartphones for LIDAR sensing and thermal imaging. All this may eventually result in an overflow of potentially useful aerial imagery, which is where MicroMappers would come in. Digital volunteers could easily use MicroMappers to quickly tag UAV footage in support of humanitarian relief efforts. Of course, UAV footage from official sources will also continue to play a more important role in the future (as happened following Hurricane Sandy). 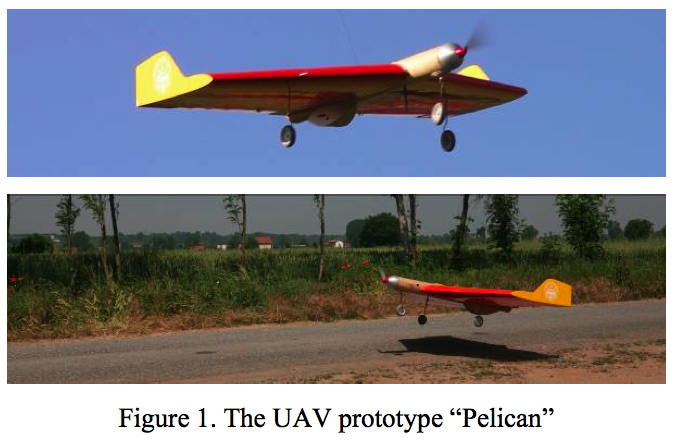 But professional UAV teams are already outnumbered by DIY UAV users. They simply can’t be everywhere at the same time. But the crowd can. And in time, a bird’s eye view may become less important than a flock’s eye view, especially for search & rescue and rapid disaster assessments. My colleague Mark Hanis recently co-authored this Op-Ed in the New York Times advocating for the use of drones in human rights monitoring, particularly in Syria. The Op-Ed has provoked quite the debate on a number of list-serves like CrisisMappers, and several blog posts have been published on the question. I’ve long been interested this topic, which is why I included a section on drones in this official UN Foundation Report on “New Technologies in Emergen-cies and Conflicts: The Role of Information and Social Networks.” I also blogged about the World Food Program’s (WFP) use of drones some four years ago. Some critics have made some good points vis-a-vis the limitation of drones for human rights surveillance. But some have also twisted the Op-Ed’s language and arguments. The types of drones or UAVs that an NGO might be able to purchase would not have the advanced technology required to capture the identify of perpetrators, according this critic. But at no point do Mark and his co-author, Andrew Sniderman, actually argue that drones should be used to document the identity of those committing human rights violations. Rather, “A drone would let us count demonstrators, gun barrels and pools of blood.” And what if a consortium of NGOs do receive substantial funding to acquire a high-end drone for human rights surveillance purposes? Moreover, as drones become cheaper and smaller, using them to capture the identity of perpetrators will become increasingly possible. This same critic notes quite rightly that humanitarian drones would “not have been able to monitor any mistreatment of Mandela in his cell on Robben Island. Nor will they be able to monitor torture in Syrian detention facilities.” Indeed, but again, nowhere in the Op-Ed do the authors claim that drones could serve this purpose. So this is again a counter-argument to an argument that was never made in the first place. (This critic seems to enjoy this kind of debating tactic). As the authors fully acknowledge, the use of humanitarian drones would “violate Syrian airspace, and perhaps a number of Syrian and international laws.” Some are concerned that this would “cause the Syrian government to even further escalate its military response.” If this is really the argument made against the use of drones, then this would beg the following question: should existing interventions in Syria also be vetoed since they too risk provoking the regime? This argument almost seeks to make a case for non-interference and non-intervention. The argument also supposes that the Syrian regime actually needs an excuse to escalate the slaughter of civilians. This is a clear case where the regime has clearly and repeatedly violated the Responsibility to Protect (R2P) principle and has thus given up any legitimate claim to territorial sovereignty. “In any event, violations of Syrian sovereignty would be the direct consequence of the Syrian state’s brutality, not the imperialism of outsiders” (NYT Op-Ed). And yet, one critic still argues that using drones in Syria would “set an unfortunate precedent […] that human rights organizations are willing to violate international law […].” According to R2P, Syria’s claim to sovereignty expired almost a year ago. Granted, R2P is an international norm, not (yet) international law, but as the authors of the Op-Ed acknowledge, this type of intervention “isn’t the kind of thing nongovernmental organizations usually do. But it is very different from what governments and armies do. Yes, we (like them) have an agenda, but ours is transparent: human rights. We have a duty, recognized internationally, to monitor governments that massacre their own people in large numbers. Human rights organizations have always done this. Why not get drones to assist the good work?” Besides, to assume that human rights organizations have never violated laws in the past would be naive at best. Human rights organizations often smuggle information and/or people across borders, I know this for a fact. As for the argument that using drones “could make even traditional human rights monitoring in repressive countries more difficult,” this is certainly true, as is any other type of intervention and use of technology, like digital cameras, Twitter, blogging, satellite imagery, etc. This same critic quotes another who points to surface-to-air misslies as being a regime’s obvious antidote to human rights drones. Indeed, such cases have been reported in Sri Lanka, as I learned back in 2005 from a colleague based in Colombo. Providing a regime with non-human targets is preferable to them using live ammunition on children. Regimes can also destroy mobile phones, digital cameras, etc. So does that mean human rights activists should refrain from using these technologies as well? More from the critic: “cell phones can go more places than drones. Most people own one, and two year olds can use iPads. Cell phones can take photos that identify who is wearing what uniform and beating which protesters.” Indeed, the Op-Ed does not make any claims to the contrary. Cell phones may be able to go to more places than drones, but can they do so “unmanned“? Can cell phones take pictures of uniforms up close and personal with zero risk to the cell phone owner? The observers of the recent Arab League Mission were not free to move around as they pleased, which is one reason why the Op-Ed makes the case for humanitarian drones. Still, the critic points out that she could attach a cell phone to a weather balloon and thus create a mini-drone. For sure, DIY drones are becoming more and more popular given the new technologies available and the lower costs; as is balloon mapping. Nothing in the Op-Ed suggests that the authors would rule out these solutions. In my mind, a combination of efforts is required—call it a networked, ecosystem approach. Naturally, whether such a combination (with drones in the mix) makes sense will depend on the context and the situation. Using drones will not always make sense, the cost-benefit analysis may differ considerably depending on the use-case and also over time. From the perspective of civil resistance and non-violent action, the use of drones makes sense. It gives the regime another issue to deal with and requires them to allocate time and resources accordingly. In fact, even if human rights activists had access to the cheapest drones that do not have the ability to take pictures, flying these over Syrian airspace would likely get the attention of the regime. The result? This would “force” the regime to deal with something new and hopefully draw their fire away from civilians, even if momentarily. At the very least, it would use up some of their military ammunitions. More importantly, there’s also a plausible psychological effect here: no one likes mosquitos buzzing around their heads. It’s annoying and frustrating. Harassing repressive regimes can certainly have negative consequences. But they are part and parcel of civil resistance tactics. In certain circumstances, these risks may be worth taking, especially if those who decide to use drones for these purposes are Syrian activists themselves or operating under the direction of these activists. Either way, the duty to bear witness remains and is recognized internationally. From a financial cost-benefit perspective, there’s no doubt that “the comparative advantage on technological platforms lies with foreign governments, rather than the NGO community,” as this critic points out. But foreign governments do not readily make their imagery public for the purposes of advocacy. This would likely place unwanted pressure on them to react if they publicly shared the extent of the evidence they had on the atrocities being committed in Syria and elsewhere. Update 2: I wrote this follow-up post on the use of drones for civil resistance.